The Easter bunny is on his way! Sometimes he brings chocolate, jelly beans, and even carrots. The grocery store aisles are filled with egg-shaped items and marshmallow treats for better or for worse. Personally, I love the Cadbury Mini-Eggs. 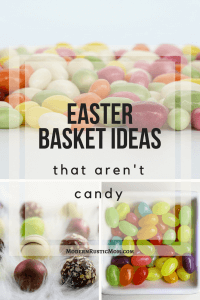 All chocolate aside, you may or may not want your child to have Easter candy for a variety of reasons: allergy, chemicals, sibling fights, etc. 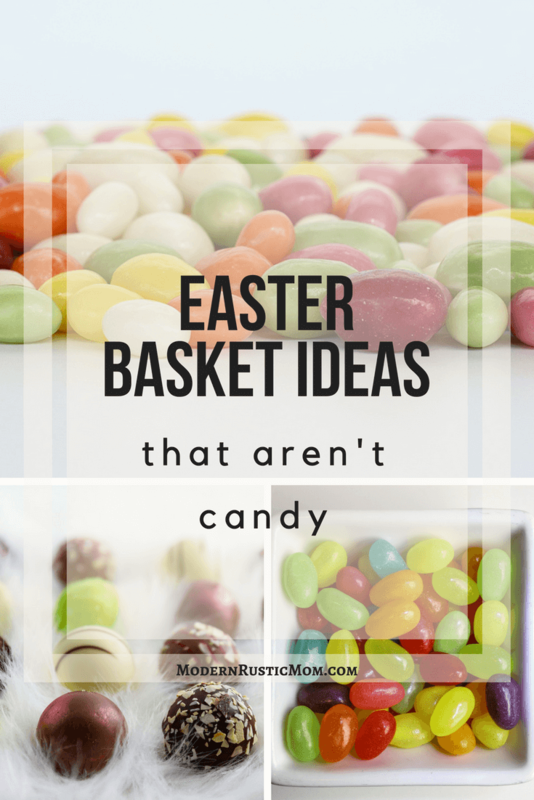 So here are a few non-candy ideas to fill their Easter basket. Check out the specific Idea List I made on Amazon. No matter the occasion, books are always a good idea. They are a great way for children to learn about the holiday and for you to have some quiet time after a busy celebration. Dress-up can be silly and educational at the same time! Dress-up encourages emotional regulation, imagination, and relationship-building. The Thoughtful Parent has a helpful discussion on this topic. If it’s been a while, go through the box and see if you have costumes of all sorts from princess to police officer. Throw in a couple of hats so you can join in the fun too! Kids love to copy so why not let them copy you in the kitchen. A couple of kid-size pots and pans will keep them busy at the counter and away from the stove. Cooking at home tends to be healthier and involving them at an age-appropriate level will build a natural food curiosity. I’m not saying this will cure your toddler’s pickiness (how I wish that was true!) but it might help them try a few new t hings. Warmer days will be here soon! Thank goodness! Sidewalk chalk lets the kids practice their creativity and you avoid any real clean-up. C’mon, who doesn’t love bubbles? Even our dog loves bubbles. Try the bubble container that doesn’t spill. Stickers, if you’re willing to put up with finding them in your carpet or on our cabinets, keep kids busy for at least 10 minutes. Little Miss C loves stickers and has even been motivated to use the potty with some well presented stickers. You can even get reusable stickers. How will you celebrate? Do you have an egg hunt? Don’t forget to check out this Idea List I made. With a 3 year old in the house this is just what I was looking for. Honestly, she loves eggs, and I considered actually giving her a carton of eggs in a basket because she loves nothing more than cracking them in the kitchen and helping me cook. It’s the little things that make her happy, and I’m grateful for that. 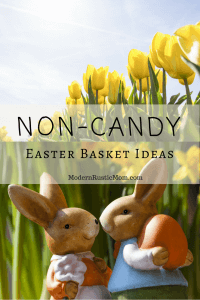 The last thing I want to do is introduce her to candy baskets, but I do want her to be able to enjoy holidays. 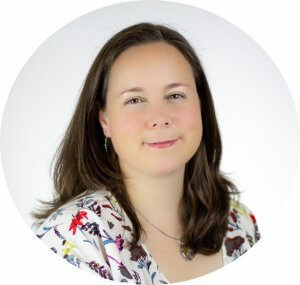 Your list strikes a great balance, thank you! Sounds like you are raising a wonderful person! And that’s so sweet that she likes to help you cook <3 Hope you and your family have a wonderful Easter! This is almost exactly what my girls are getting! We have a giant tub of chalk from last year so I skipped that and bought each a kite instead. I’m such a grinch about candy (mostly because I end up eating it….) I love all your ideas!